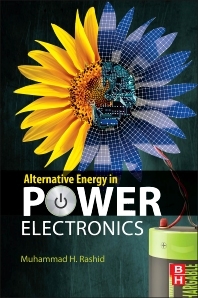 This new resource is a practical overview of designing, testing and troubleshooting power electronics in alternative energy systems, providing you with the most important information on how power electronics components such as inverters, controllers and batteries can play a pivotal role in the successful implementation of green energy solutions for both stand-alone and grid-connected applications. You will learn how to choose the right components for diverse systems, from utility-scale wind farms to photovoltaic panels on single residences, how to get the most out of existing systems, and how to solve the tough challenges particular to alternative energy applications. Whether you are a renewables professional who needs to understand more about how power electronics impact energy output, or a power engineer who is interested in learning what new avenues the alternative energy revolution is opening for your work, start here with advice and explanations from the experts, including equations, diagrams and tables designed to help you understand and succeed. Muhammad H. Rashid is employed by the Florida Polytechnic University as a Professor of Electrical Engineering. Previously he was employed by the University of West Florida, Pensacola, Florida as a professor of electrical and computer engineering. He was also employed by the University of Florida as Professor and Director of UF/UWF Joint Program. Rashid received B.Sc. degree in Electrical Engineering from the Bangladesh University of Engineering and Technology, and M.Sc. and Ph.D. degrees from the University of Birmingham in UK. Previously, he worked as Professor of Electrical Engineering and the Chair of the Engineering Department at Indiana University- Purdue University at Fort Wayne. Also, he worked as Visiting Assistant Professor of Electrical Engineering at the University of Connecticut, Associate Professor of Electrical Engineering at Concordia University (Montreal, Canada), Professor of Electrical Engineering at Purdue University Calumet, and Visiting Professor of Electrical Engineering at King Fahd university of Petroleum and Minerals (Saudi Arabia), as a design and development engineer with Brush Electrical Machines Ltd. (England, UK), a Research Engineer with Lucas Group Research Centre (England, UK), a Lecturer and Head of Control Engineering Department at the Higher Institute of Electronics (in Libya & Malta). Dr. Rashid is actively involved in teaching, researching, and lecturing in electronics, power electronics, and professional ethics. He has published 22 books listed in the US Library of Congress and more than 160 technical papers. His books are adopted as textbooks all over the world. His book, Power electronics has translations in Spanish, Portuguese, Indonesian, Korean, Italian, Chinese, Persian, and Indian edition. His book, Microelectronics has translations in Spanish in Mexico and in Spain, Italian, and Chinese. He has received many invitations from foreign governments and agencies to give keynote lectures and consult, by foreign universities to serve as an external examiner for undergraduate, master's and Ph.D. examinations, by funding agencies to review research proposals, and by U.S. and foreign universities to evaluate promotion cases for professorship. Dr. Rashid has worked as a regular employee or consultant in Canada, Korea, United Kingdom, Singapore, Malta, Libya, Malaysia, Saudi Arabia, Pakistan, and Bangladesh. Dr. Rashid has traveled to almost all States in USA and many countries to lecture and present papers (Japan, China, Hong Kong, Indonesia, Taiwan, Malaysia, Thailand, Singapore, India, Pakistan, Turkey, Saudi Arabia, United Arab Emirates, Qatar, Libya, Jordan, Egypt, Morocco, Malta, Italy, Greece, United Kingdom, Brazil, and Mexico). He is a Fellow of the Institution of Engineering & Technology (IET, UK) and a Life Fellow of the Institute of Electrical and Electronics Engineers (IEEE, USA). He was elected as an IEEE Fellow with the citation “Leadership in power electronics education and contributions to the analysis and design methodologies of solid-state power converters.” Dr. Rashid is the recipient of the 1991 Outstanding Engineer Award from The Institute of Electrical and Electronics Engineers (IEEE). He received the 2002 IEEE Educational Activity Award (EAB) Meritorious Achievement Award in Continuing Education with the following citation "for contributions to the design and delivery of continuing education in power electronics and computer-aided-simulation". He is the recipient of the 2008 IEEE Undergraduate Teaching Award with citation: For his distinguished leadership and dedication to quality undergraduate electrical engineering education, motivating students and publication of outstanding textbooks. He is also the recipient of the IEEE 2013 Industry Applications Society Outstanding Achievement Award. Dr. Rashid is an ABET program evaluator for electrical and computer engineering (and also from 1995-2000) and was an engineering evaluator for the Southern Association of Colleges and Schools (SACS, USA). He is also an ABET program evaluator for (general) engineering program. He is the Series Editors of Power Electronics and Applications, and Nanotechnology and Applications with the CRC Press. He serves as the Editorial Advisor of Electric Power and Energy with Elsevier Publishing. Also a Series editor of Energy Systems in Electrical Engineering with Springer Publishing. He lectures and conducts workshops on Outcome-Based Education (OBE) and its implementations including assessments. Dr. Rashid is a Distinguished Lecturer for the IEEE Education Society and a Regional Speaker (previously Distinguished Lecture) for the IEEE Industrial Applications Society. He also authored a book on “The Process of Outcome-Based Education - Implementation, Assessment and Evaluations”.2012 UiTM Press, Malaysia.